It’s been a turbulent month of oscillating interest rate expectations. Early on, I argued that the case was swinging in favour of a hold, in contrast to market pricing and economists’ forecasts, with obviously implications for the currency. The next few weeks lent support to this thesis, with chances of a cut diving as iron ore rallied wildly and a range of data releases pointed to a temporary patch of strength in the economy as the cyclical sectors fired following the February rate cut. This pushed AUDUSD well up from its lows at the beginning of the month; last night it breached .8000 on the back of woeful US GDP figures. 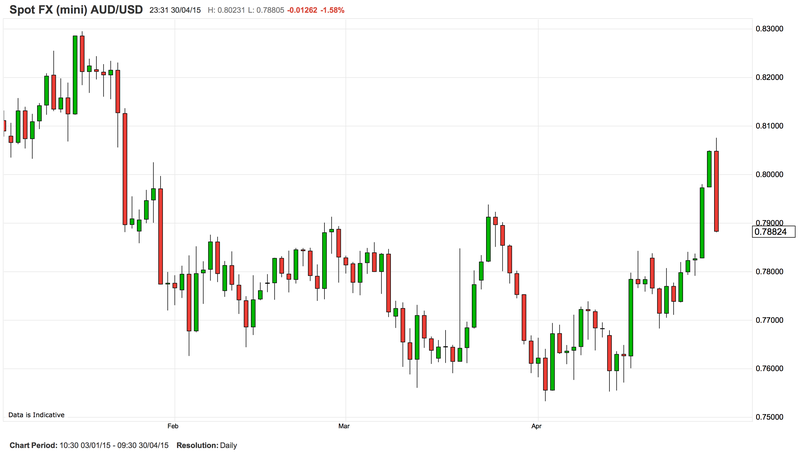 Whilst musing on the possibility of a hold in May, I noted that a key concern was AUD strength forcing the RBA’s hand. Another (unmentioned) consideration was that APRA would move on macpru and thus the RBA would feel satisfied to ease again. If the RBA saw that sufficient regulatory breaks were being applied to the investor mortgage freight train, a cut could be on the cards. If we go back to an even earlier post, there was an article I linked to by Fairfax journo Peter Martin in which he offered a strong indication that the RBA would hold in April. This irritated me enough to lambast the “extraordinary failure” of policymakers for permitting a cyclical property boom to supplant a real devaluation (which is more or less been exactly what’s happened). And as it turned out, his sources were solid. There was no cut in April. Well tonight the clairvoyant offered another premonition: this time he sees a cut. Although the Bank is concerned about the effect another of cut on Sydney house prices, it is prepared to rely on its sister regulator, the Australian Prudential Regulation Authority to ensure banks do not cut their lending standards further in order to drum up more business after the cut. Almost $20 billion has been wiped off the value of the big four banks by sharemarket investors this week, partly because of expectations the prudential regulator will take quicker-than-expected action to deal with the threat posed by rampant property speculation. Yes, partly. But also because expectations of a rate cut tanked. If the RBA does cut expect a solid rebound. Whether a rally in financials lasts is all down to the sting in the macpru regime. We’ll learn on Tuesday just how good Peter’s sources are, but currency markets are already all over it. Tough month. I have to confess after finding it “very hard to see the RBA cutting interest rates next month” a matter of days ago, it looks like the RBA is laying the groundwork for a cut. APRA’s macpru house had better be in order. This entry was posted in Uncategorized and tagged APRA, Peter Martin on April 30, 2015 by MJV.